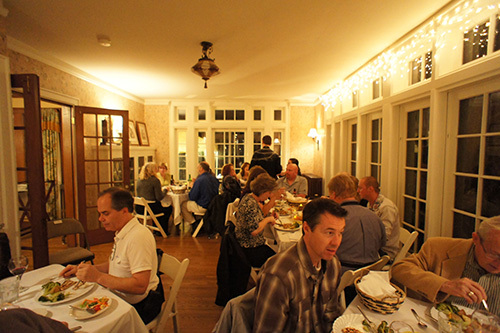 The McLean House is an ideal setting for an intimate wedding reception or other gathering. The grounds provide a delightful natural setting and the elegant interior combines the warmth and charm of the 1920’s with modern conveniences. During the warmer months, the 2.4 acre gardens and 30′ by 60′ patio offer a beautiful space for larger groups (up to 100 guests) and a natural backdrop for photos. In the cooler months, October through April, the home itself accommodates 60 people, or 40 people comfortably at a sit down dinner. For your convenience, the second floor features a beautiful bridal suite and groom’s room. The rooms are sparingly decorated with antique furnishings, creating a wonderful setting for photographs before the big event. We offer a fully functional prep kitchen for the caterer of your choice. Many amenities are available for no extra charge, including tables, chairs, linens, dinnerware, and glassware. The McLean House provides a perfect location for hosting family, friends and colleagues. The home’s main floor provides ample space for entertaining while the second floor parlor rooms offer opportunity for smaller groups and break-out areas. Perfect for smaller groups, McLean House offers the flexibility and convenience of an off-site meeting space. Our amenities allow you to design comfortable and efficient room set-up to best meet your needs and a wide-array of local businesses off easy access to the products and services you want. With both interior and exterior space there is plenty of room for your participants to circulate and for you to set up separate break out areas. The kitchen is available for your use if you prefer to “DIY” your food and beverage service. alternatively, we have many fine local caterers who can help make certain your attendees remain energized and productive!